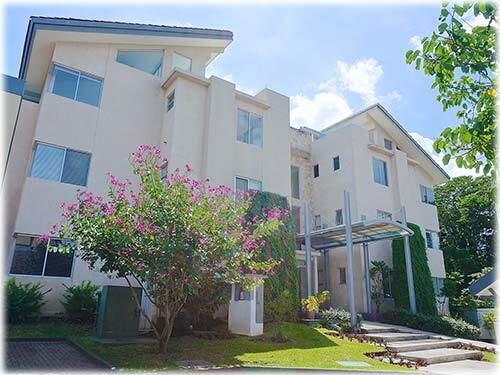 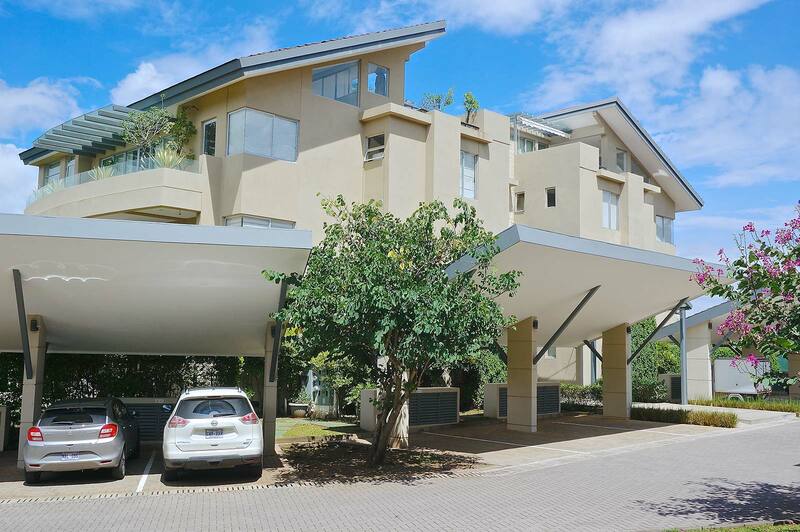 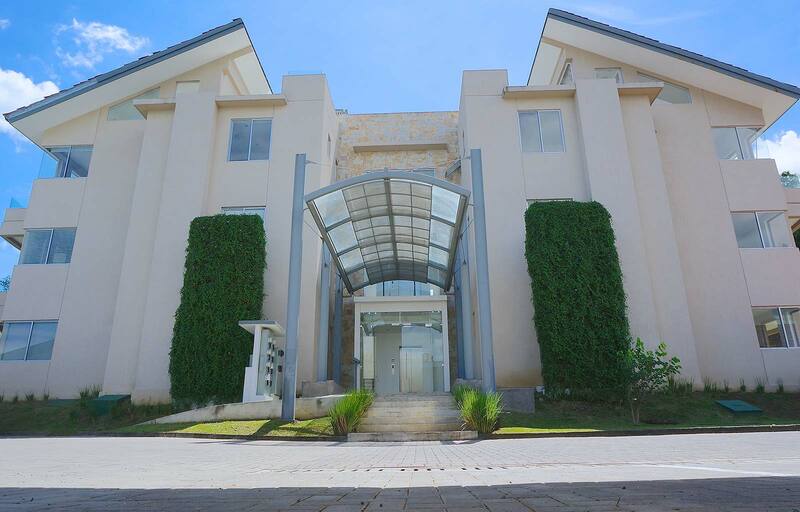 Enjoy a luxury, quiet-yet-convenient living surrounded by nature in Santa Ana on this One-Level Condo with Private Garden. 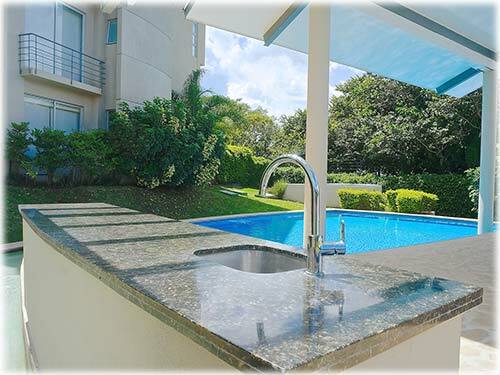 Award Winning Contemporary Architecture, ample spaces, lots of light and a prime location exceed even the most discerning taste. 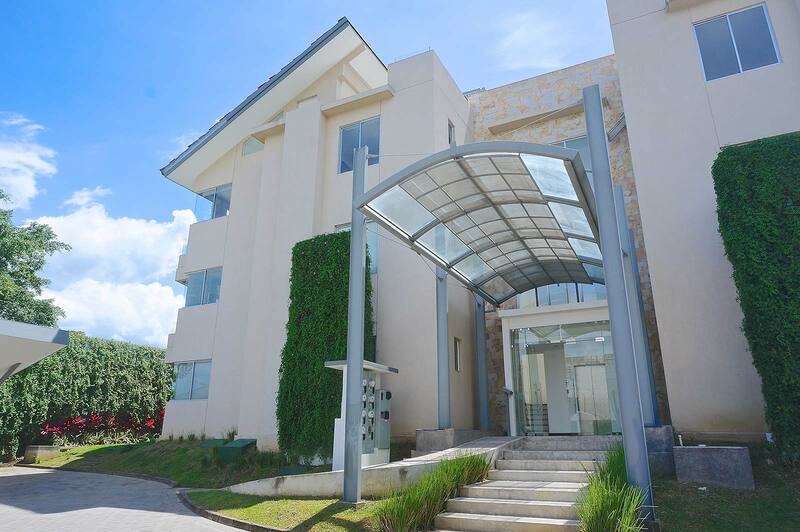 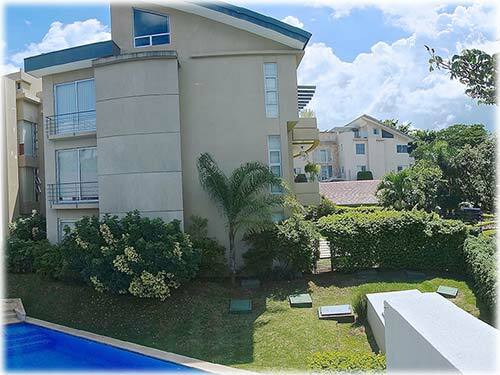 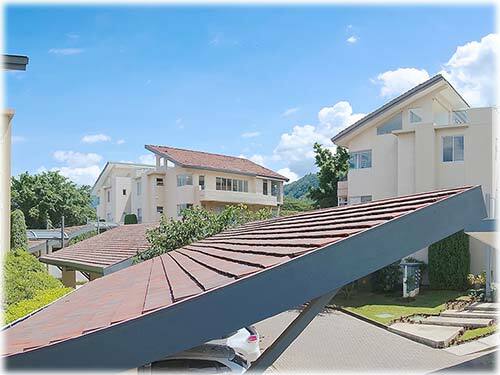 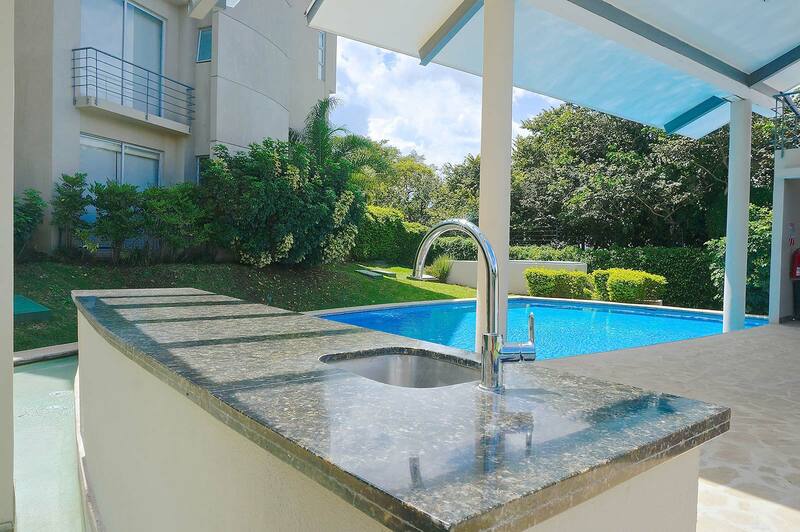 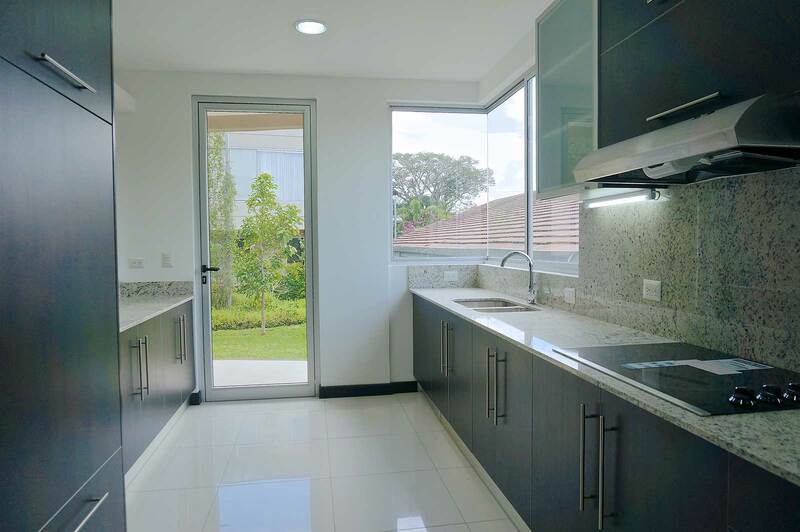 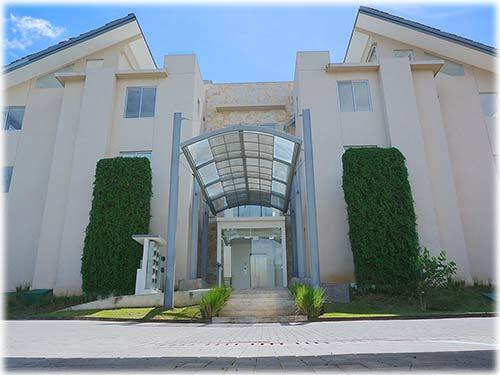 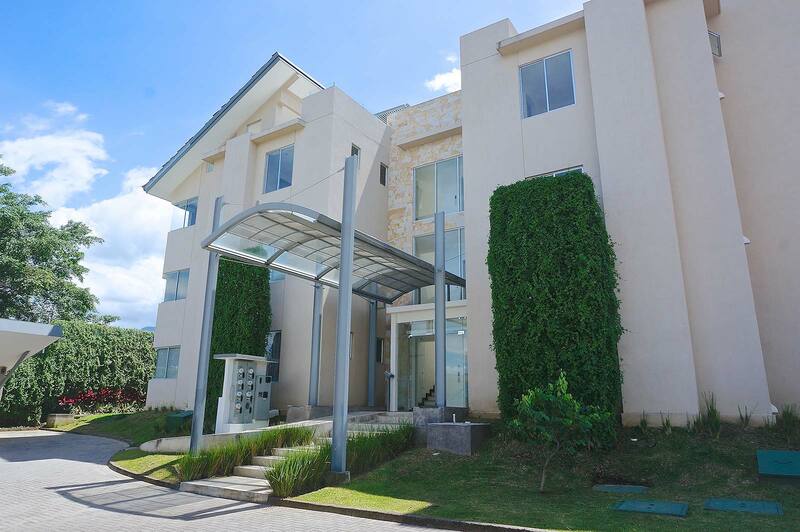 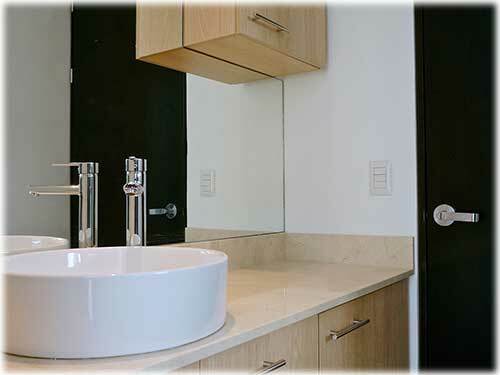 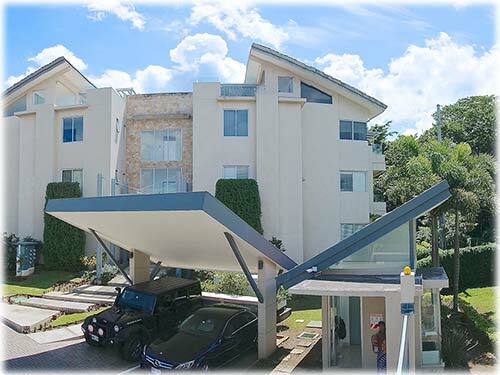 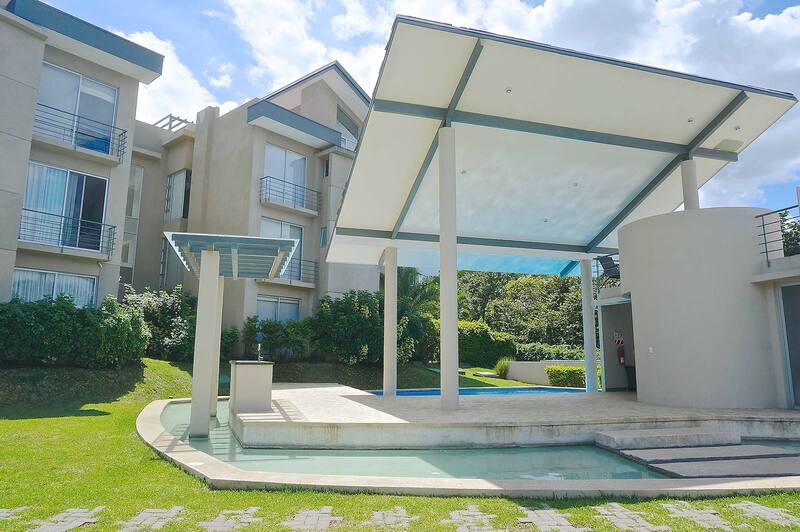 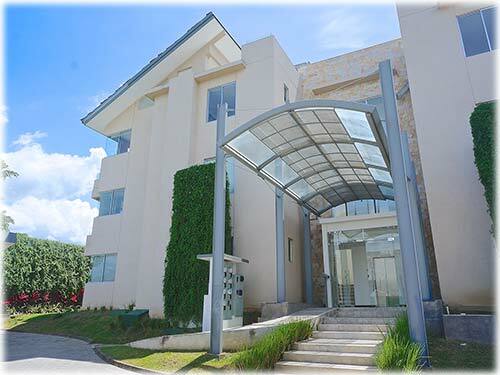 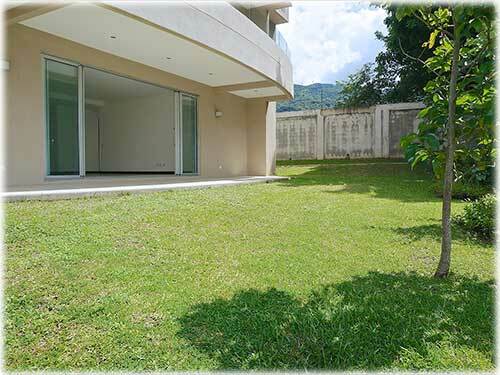 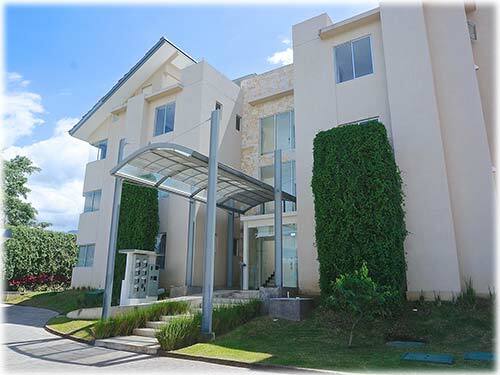 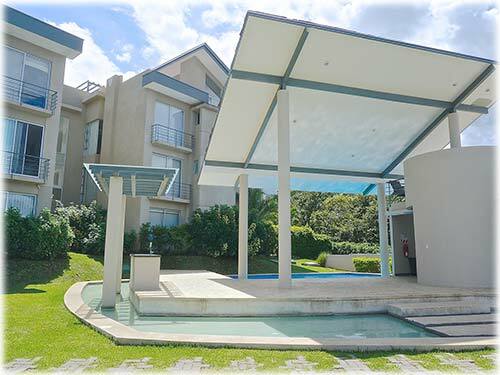 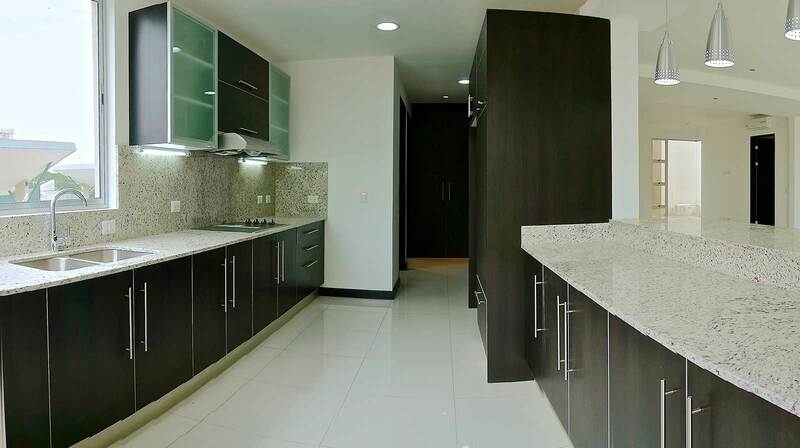 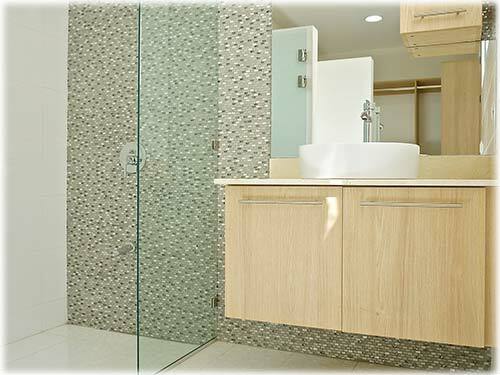 This luxury complex condo is surrounded by the characteristic green nature of Costa Rica. 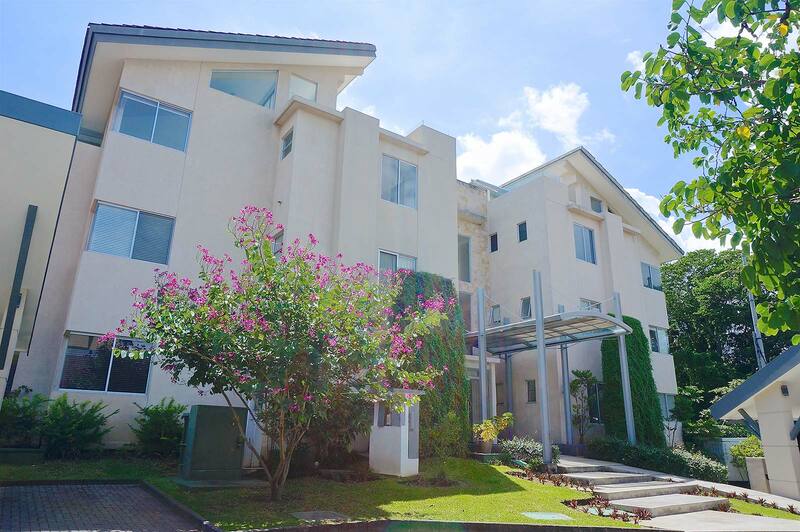 With a prime location in a peaceful area of Santa Ana, this first-floor condo has 2 parking lots near the apartment for the convenience of those who will live in it. 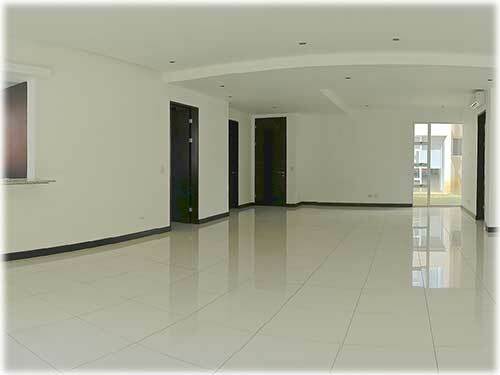 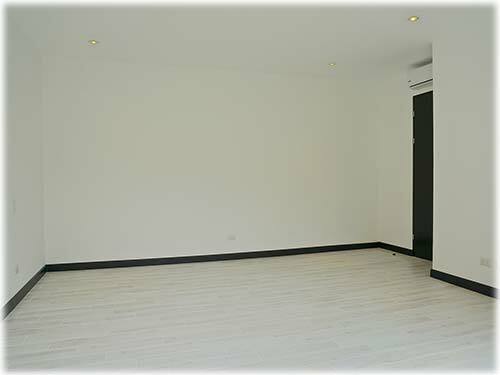 Upon entering the condo, you will find a large and bright common area climatized with A/C. 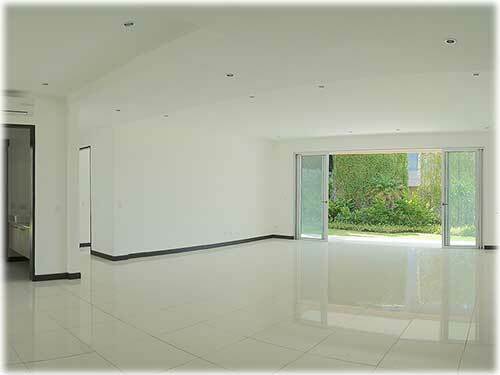 There is great room planned for an integrated living and dining room. 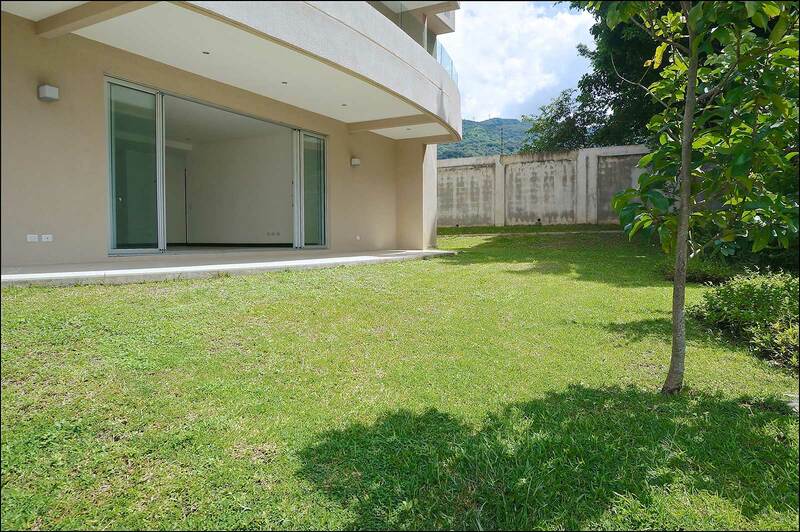 At the end of the living room, you'll find a big glass sliding door that illuminates all of these spaces, opening up to a terrace that overlooks the beautiful green gardens of the complex. 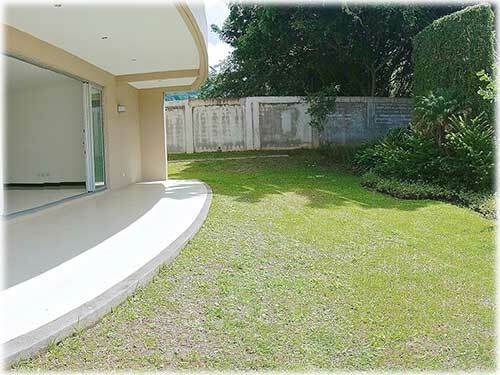 The terrace can be used as an outdoor living room as well, great to enjoy a cup of coffee during the sunset, reading a book or have friends over. 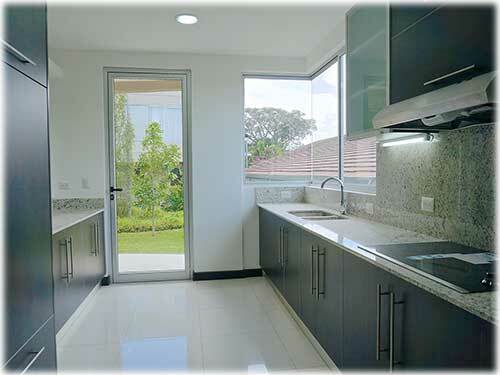 On the left-hand side of this inner social area, you’ll find the kitchen. 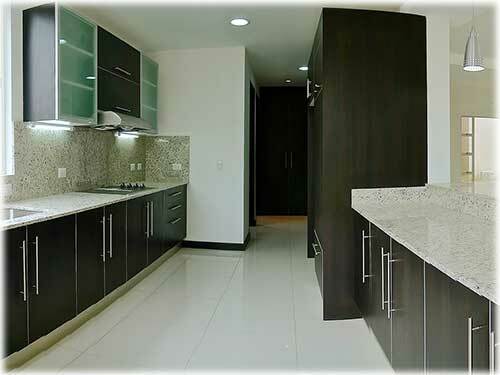 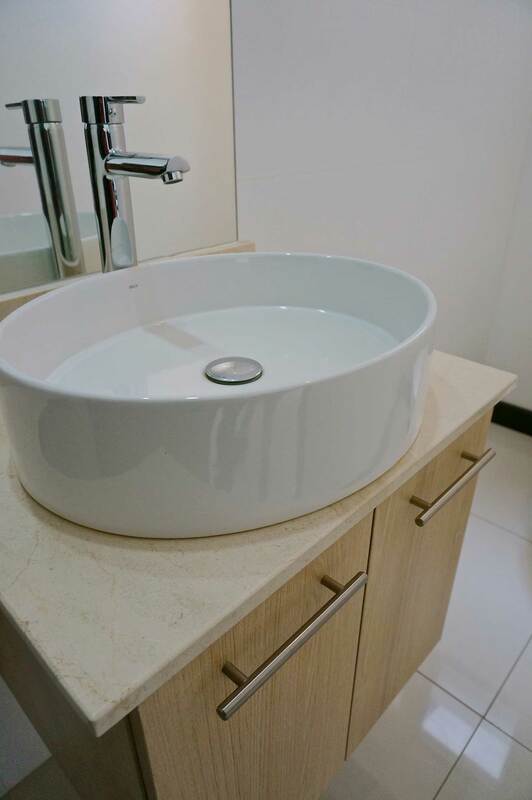 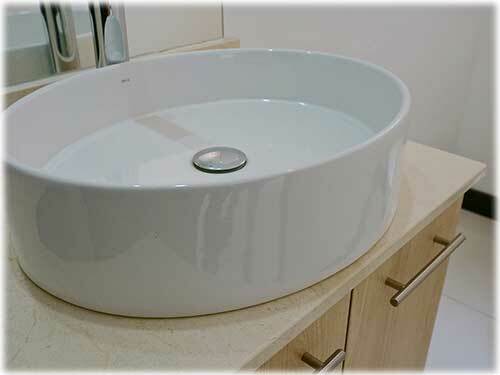 The stove is glass-ceramic and it comes with luxury white cabinetry, making this area also very luminous and clean. 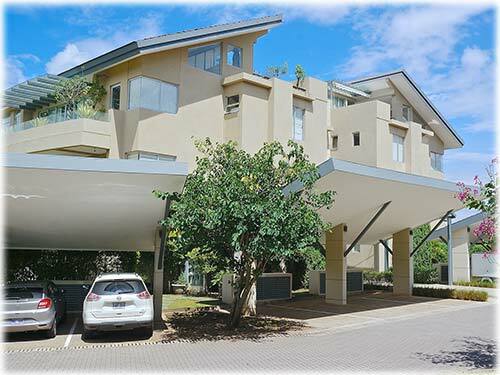 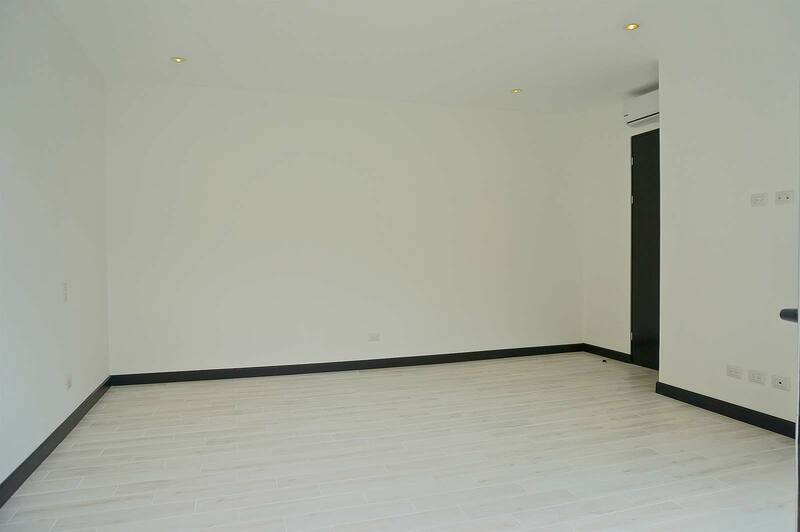 On the right-hand side of the unit, you will find the master bedroom and the guest bedroom. 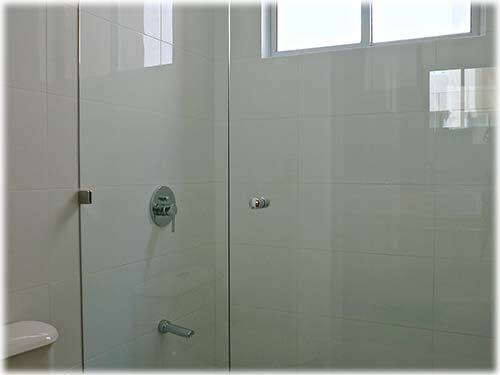 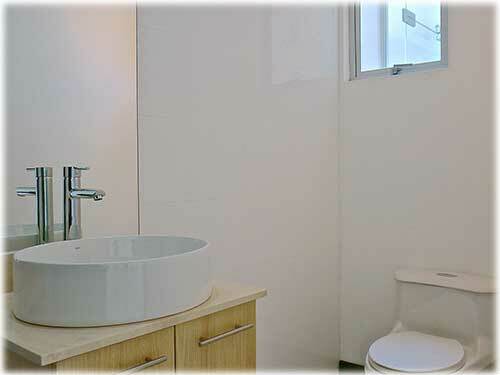 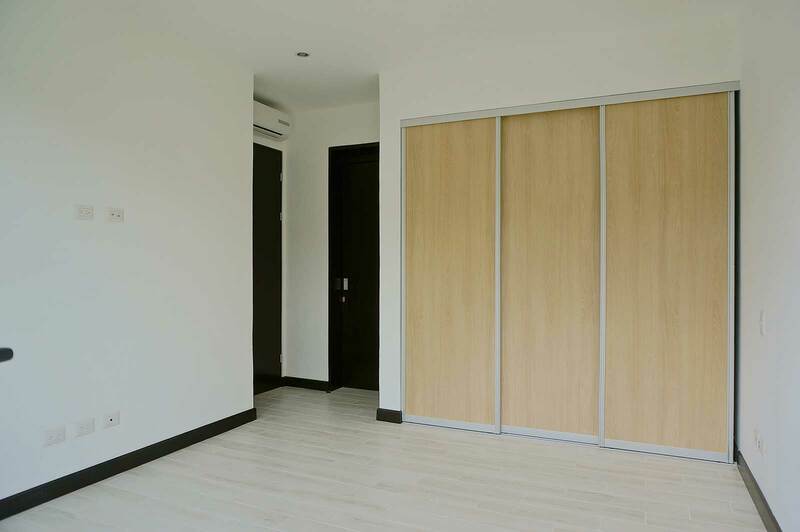 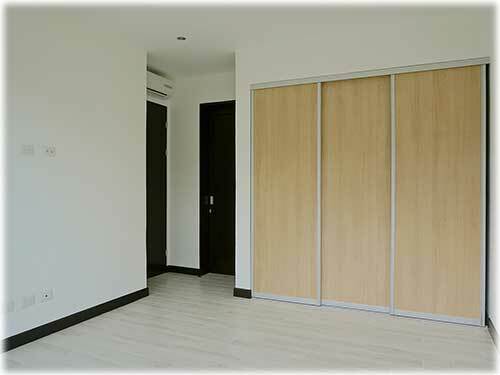 The master room is spacious with sliding doors that open to the terrace, it has a full ensuite bathroom. 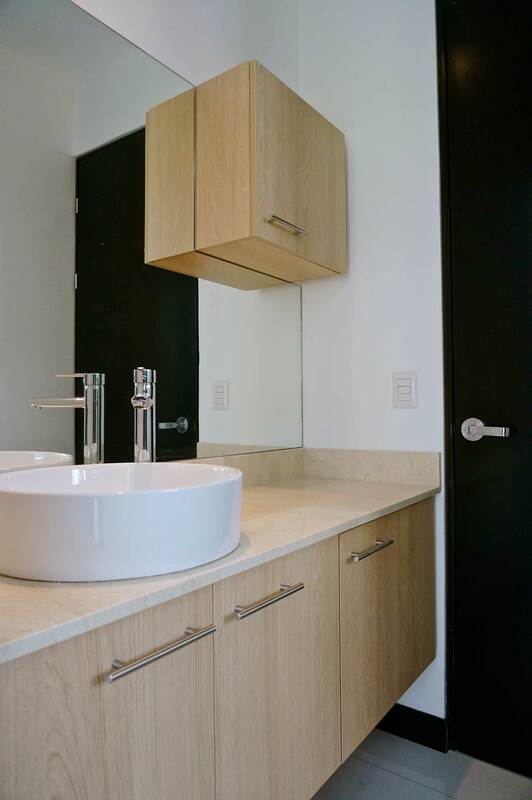 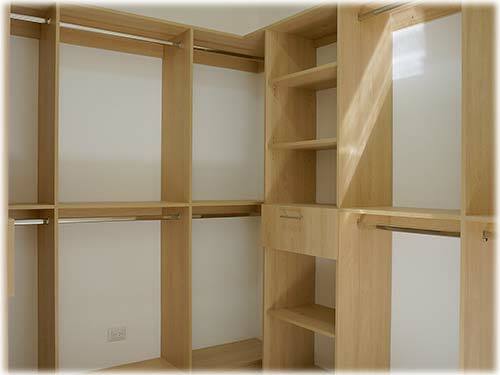 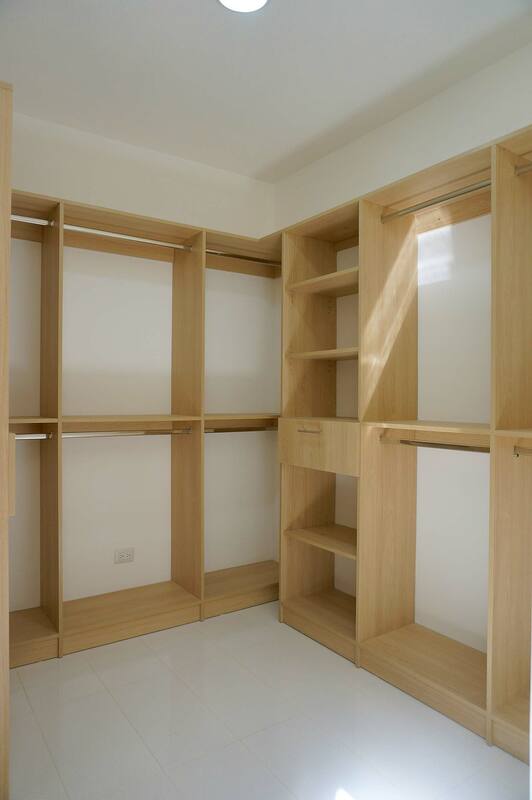 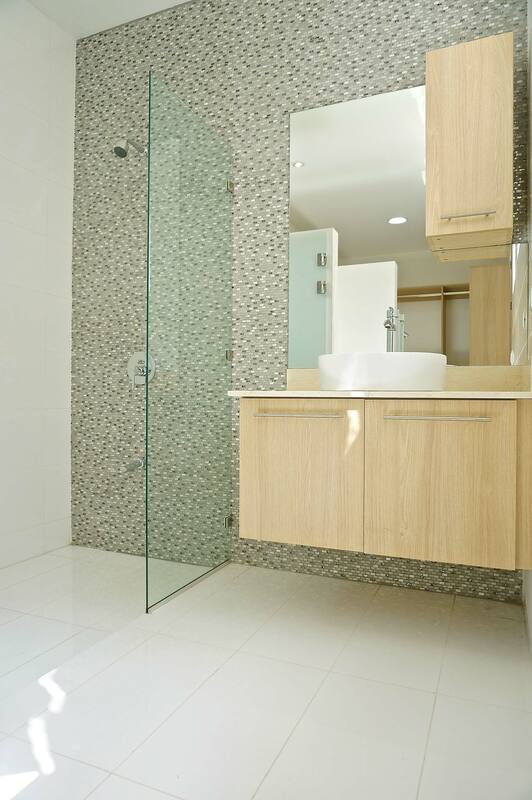 The guest bedroom has also an ensuite bathroom and a large closet. 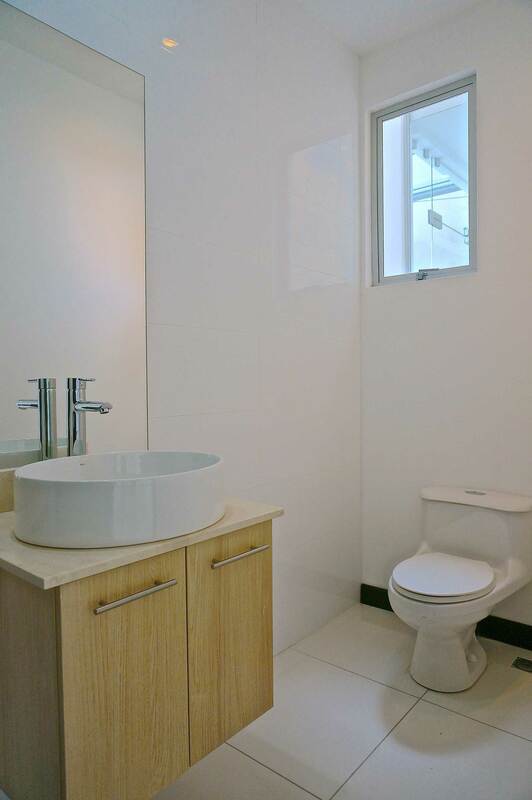 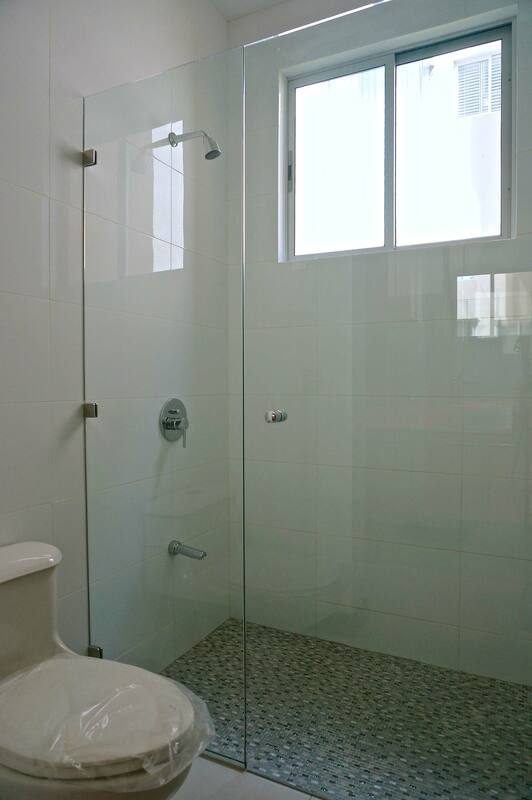 There is also a half bathroom for visitors, a laundry room, and a maids quarter with a complete bathroom that can also be used as an office. 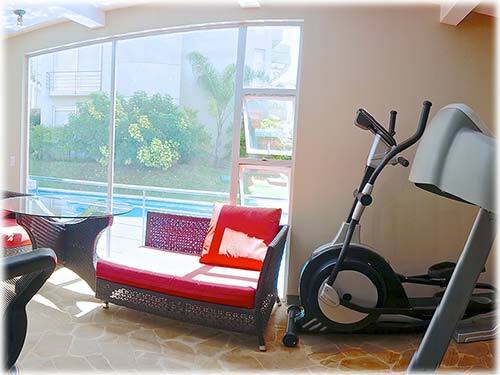 The luxury complex has a great social area completely apart of the condo buildings, where you can plan any kind of activities with friends, meals or meetings. 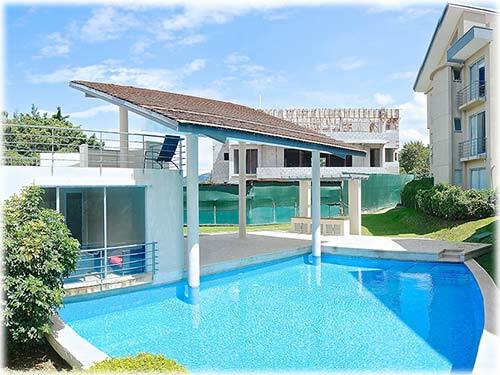 The swimming pool is right beside the social area, ready to enjoy a sunny day!